In 1855 Michael and John Studholme secured a leasehold for grazing in the Waimate district, South Canterbury. 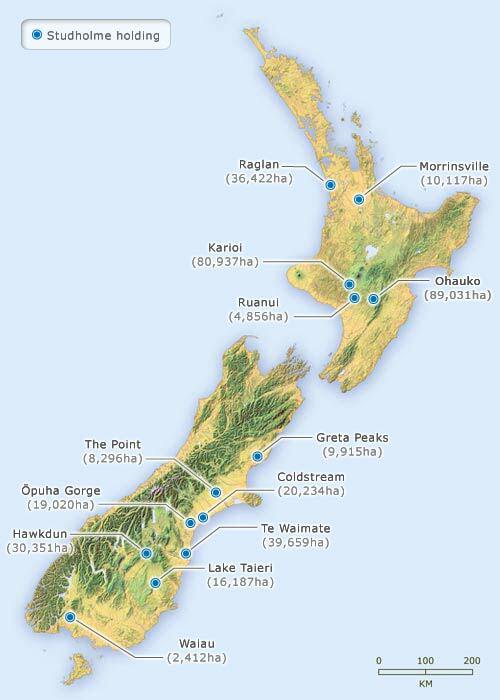 Over the next 20 years they acquired, either through purchase or leasehold, 146,074 hectares (360,957 acres) in eight properties in the South Island and 221,363 hectares (547,000 acres) in five properties in the North Island. Huge holdings such as this were not unusual in the second half of the 19th century, and there was also a high level of land ownership among the adult male population generally. This map shows the names and sizes (in hectares) of the properties of the Studholme family.